When children sleep badly, the whole family dynamic suffers. Parents are tired and cranky, kids are fatigued and unproductive, and no-one is performing at their best. Suffice it to say, sleeping issues can derail even the most well-organised familial unit. 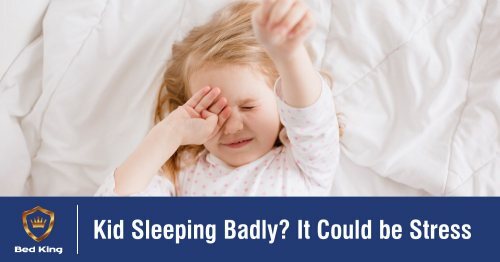 So, what should you do if your child who normally had no qualms about hitting the hay all of a sudden starts to have trouble falling and remaining asleep? One of the first things you should do is look for signs of stress. This may seem a little counterintuitive - after all, what do toddlers and tweens have to stress about? Well, according to the findings of scientific studies, children are as susceptible to the effects of stress as adults are. A lack of appetite. Every kid's appetite differs, but if your child's appetite is severely diminished for an extended period of time, alarm bells should be ringing. Bedwetting. If your child has been potty-trained for a while and they suddenly start to have nighttime accidents again, it could indicate emotional stress. Headaches and upset stomachs. Tension headaches and nervous stomach pains can also point toward stress. Unmanaged emotions. Lots of aggression, unexplained tears and even a sudden inability to relax could be linked to stressful encounters. Listlessness. A sudden unwillingness to participate in school or family activities is also not good. So, what should you do when you notice these signs of stress in your child? First things first - talk to them. Ask them if anything has happened to make them feel unhappy or insecure. If you don’t get any feedback to that effect, you could attempt to create a more harmonious household by putting in place regular family meals and opportunities to bond over games or active outings. If you still encounter issues that pertain to stress, you could reach out to a teacher to find out whether your child has been displaying signs of stress at school, or book some time with a counsellor. Child psychologists are trained to decipher behavioural cues and will help you to get to the root of the matter so it may be resolved. Disclaimer: This content is not intended to be a substitute for professional medical advice, diagnosis, or treatment. Always seek the advice of your physician or another qualified healthcare provider with any questions you may have regarding a medical condition.